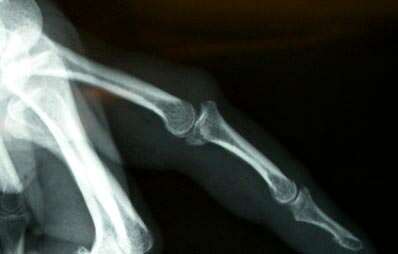 DS, 45 year old male with an acute fracture of his left ring finger PIP joint. 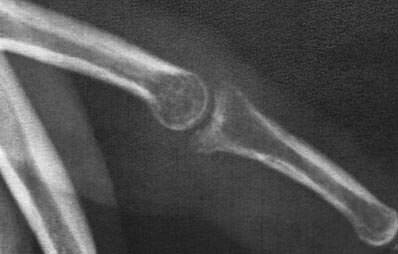 His pre-op photo shows fracture of the base of the middle phalanx involving ~50% of the joint surface. The middle phalanx is subluxed. A TurnKey FCS was applied five days post injury. We do not have any x-rays with the device on. The TurnKey FCS was worn for six weeks. His active ROM at 2.5 months post device application was 15 to 85 degrees. He had a stable joint with a concentric reduction of the joint with a mild dye punch just volar to the mid axis of the base of the middle phalanx. He had minimal swelling and no pain.